Western world Medical Acupuncture (MA) works on targeting the central nervous system to create an endorphin release into the brain, helping to block pain pathways. Traditional Chinese Medicine (TCM) on the other hand relies on the theory of freeing the stagnant flow of Qi (chee) and yin/yang to rebalance the body, promoting health through empirical practice and intuition. These two systems may seem separated by their actions of healing but we now realise that TCM may have been working on what we now consider the modern aspect of neuroanatomy and physiology. MA is an excellent alternative to the sometimes uncomfortable pressure used in Trigger Point Therapy. Several needles can be used at once, the client may not feel them and therefore the overall session can be quick and more relaxing. Dry needling is another term given to MA to explain that it uses very fine filament needles and not hollow hypodermic needles that injects fluid…I’m pleased to clear that one up! 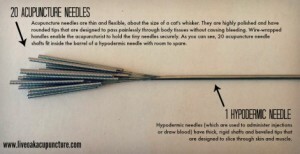 So if you ‘hate’ needles, the latter isn’t going to be used during your treatment….you’ll be delighted to hear. As the needle diameter is so very thin it may not be felt upon insertion. Once it is delivered into the body it may produce a brief twitch or dull cramping sensation…we are all individuals who feel things differently from the next person. Can it help to stop smoking, clear up psoriasis or balance hormone levels… in a word…no. MA is designed to alleviate pain through muscular and connective tissue disorder. I’ve used MA successfully with acute and chronic pain arising from conditions of the shoulders and upper back, lower back, knees and elbows. I trained at the London School of Osteopathy in August 2015 and experienced almost immediate relief after just one session. Other students on the course noted a similar experience too and whilst we practiced on each other, some found that they needed more treatment.